Director – William Lau, Screenplay – Elise Allen, Producer – Luke Carroll, Music – Eric Colvin, Animation Directors – Conrad Helten & Gino Nichele, Production Design – Walter P. Martishius. Production Company – Mattel Entertainment/Mainframe Entertainment. Elina is one seven fairies chosen to become apprentices to The Guardians that oversee the Flight of Spring, the ritual that brings spring into being. She and Bibble travel to the Crystal Palace – although, once there, Elina finds the other apprentices to be bitchy and backbiting. Meanwhile, the scheming Laverna is trapped in the body of a toad but tricks Elina into enacting the spell that frees her. Laverna then steals the body of the apprentice fairy Sunburst and puts all the Guardians out of action. This means it is up to the apprentices to have to conduct the Flight of Spring, even though they are ill prepared. What they do not realise is that with Laverna disguised as Sunburst, this means that the Flight of Spring will be corrupted and all of Fairytopia plunged into winter. Barbie Fairytopia: The Magic of the Rainbow was the ninth of the films spun off from the popular Mattel girl’s doll by the Canadian computer animation firm Mainframe Entertainment. Mainframe’s series had begun with Barbie in the Nutcracker (2001) and continued through Barbie as Rapunzel (2002), Barbie of Swan Lake (2003), Barbie as The Princess and the Pauper (2004), Barbie and the Magic of the Pegasus in 3D (2005), Barbie in The 12 Dancing Princesses (2006), Barbie as The Island Princess (2007), Barbie & the Diamond Castle (2008), Barbie in A Christmas Carol (2008), Barbie and the Three Musketeers (2009), Barbie Presents Thumbelina (2009), Barbie: A Fashion Fairytale (2010), Barbie in a Mermaid Tale (2010), Barbie: A Perfect Christmas (2011), Barbie: A Fairy Secret (2011), Barbie: Princess Charm School (2011), Barbie in a Mermaid Tale 2 (2012), Barbie: The Princess & The Popstar (2012), Barbie and Her Sisters in a Pony Tale (2013), Barbie in The Pink Shoes (2013), Barbie Mariposa and the Fairy Princess (2013), Barbie and the Secret Door (2014), Barbie: The Pearl Princess (2014), Barbie and Her Sisters in the Great Puppy Adventure (2015), Barbie in Princess Power (2015), Barbie in Rock’n’Royals (2015), Barbie and Her Sisters in a Puppy Chase (2016), Barbie Spy Squad (2016), Barbie Star Light Adventures (2016), Barbie: Dolphin Magic (2017) and Barbie: Video Game Hero (2017), most of which retold classic fairytale stories with Barbie cast in the central role. 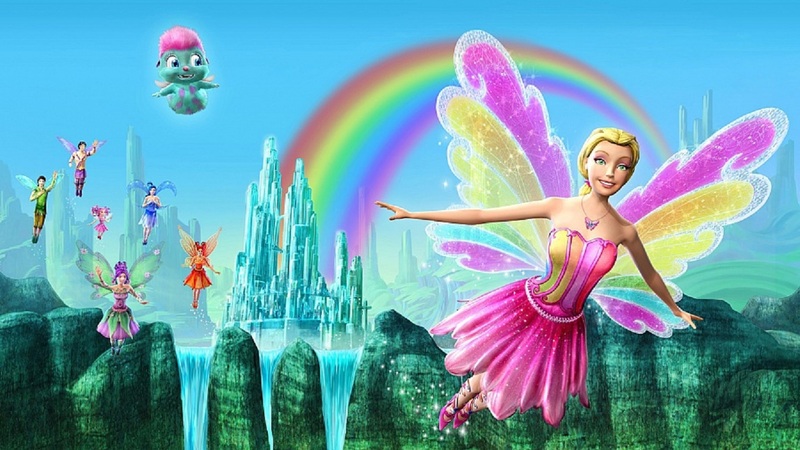 Barbie Fairytopia: The Magic of the Rainbow was the third in a sub-series of these films, which began with Barbie Fairytopia (2004) and was followed by Barbie Mermaidia (2006) and Barbie Mariposa (2008), wherein Mainframe created their own fantasy world in which Barbie plays a fairy. By now one has seen enough of Mainframe’s Barbie films that Magic of the Rainbow slips into an easily pre-packaged formula. Mainframe have certainly pushed the colour palette of the films and Magic of the Rainbow takes place among an extraordinarily rich array of rainbow-coloured hues. Mainframe’s computer animation skills have also improved so that the characters, which have often seemed somewhat flat in the previous Barbie films, have much more detail to their features. While some of the earlier Barbie films had okay fairytale stories, Magic of the Rainbow is a little too much aimed at the pre-school generation. There are a few too many characters saying things in sotto voce, especially irritating being the small furry creature Bibble who talks all in pre-verbal coos and whimpers. Though the animation has been pushed to an incredibly vibrant array of rainbow colours, the magic seems no more than waves of the wand and twinkling trails of light. Indeed the film comes out looking more like the graphics for a high-end children’s videogame.